WOW! What a change for this province (created only since September of 1905)! We used to be part of the Northwest Territories prior to that. Full of HBC (Hudson’s Bay Company) fur forts and trade between the French-Canadians, Metis, First Nations peoples and early settlers and farmers. Then turned into towns then cities. Now the city of Calgary has grown to house over a million people! Note the majority of planets in this chart are sitting at the top, most of which are within the 10th House of BEing in the PUBLIC – and the Midheaven or MC – the topmost cusp, which begins the 10th House area – is in the cardinal earth sign of Capricorn. Initiating change, using current resources to create something new, in a tangible way, that is required for the good of all, now. Both Mars and Venus are closely tied to the MC, also in Capricorn – bring together BOTH men and women, working within the traditional institution (Capricorn), politics and government in this case. In the history of our province, women being able to vote came April 19, 1916, not quite 100 years ago! The first woman to be elected to a CANADIAN legislative body was Louise McKinney, her constituency was Claresholm, Alberta as an Independent from 1917 – 1921. Also from 1917 – 1921, Roberta Price (nee MacAdams) was the first woman in COMMONWEALTH history to introduce legislation (War Veterans’ Next-of-Kin Association, 1918). She was elected as Soldier’s Overseas Representative of the Non-Partisan League, Province at Large, Alberta. Lastly, the first woman Premier of the province of Alberta was Alison Redford, from 2011 to 2014. Unfortunately, she did not have the integrity to finish her first term of office (Pluto transiting Capricorn since 2008 has systematically revealed over the years various government officials, CEOs, celebrities, and people in authority all over the world, who have had less-than integral motives re: their material gain, misuse of power and control over others). She left in disgrace and it has been mayhem at the helm of our province ever since. [historical data from: Library of Parliament, Parliament of Canada website]. Why am I waxing historical here? Because history was made once again, yesterday, by the daughter of one of the original founders of the NDP provincial political party, Rachel Notley. She is now our second woman Premier. She and her party have taken a mostly Conservative province for the past four decades into a more Socialist stance. Totally decimating what used to be the “old boys network” here in Alberta. I say this because of the 28 women elected in yesterdays vote, 27 of them are from the NDP. 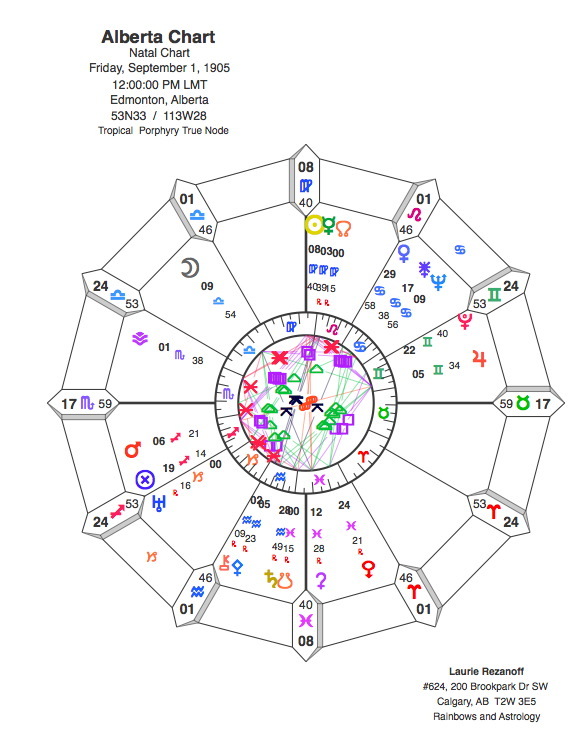 When I look at the NDP chart I see ALL of the feminine asteroids/planets cascading down from the 11th House of the Future down through the 12th House of the behind-the-scenes work being done. I also see that the Sun, Saturn (ruler of Capricorn), Jupiter, South Node and Mercury are ALL in Aquarius within that Public 10th House. We are now transitioning out of the old Age of Pisces into the New Age of Aquarius (we go through this process of changing Ages every 2500 years or so). The ‘Turning of the Ages’ it is called; and now the NDP as a party has “come of age” too – ready and ripe to bring much-needed change and a re-balance to HOW and WHY we who live in Alberta, attract material gain. Interestingly, the sign of Pisces rules the liquids of the Earth (aka oil and gas). 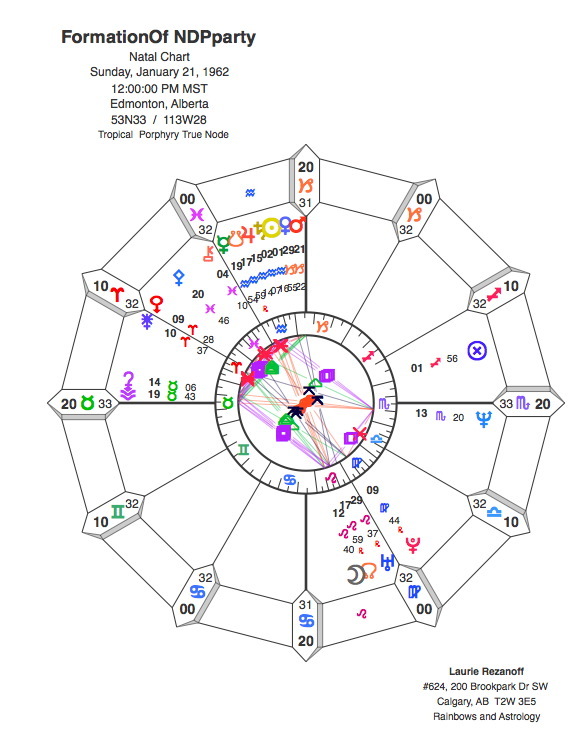 In Alberta’s chart (see below) the South Node is at 00 degrees of Pisces in the 3rd House, with Ceres (ability to feed and nurture ourselves) and Eris (re-balancing our gender roles into a more equitable and fair way) in the 4th House of country/home (aka our province where we live). That South Node speaks of a new cycle (00 degrees) of moving beyond the unresolved issues of the past victimization into Victor role. Province-wise, people-wise, livelihood-wise. It is interesting that Alberta is ‘home’ to the majority of corporate headquarters (mostly oil and gas) from around the world. And now Rachel Notley, with the NDP supporting her (and now we the people) to break away from solely relying on energy industries – to diversify and bring forth NEW technology, innovation and originality (aka Aquarius in the NDP chart). With the oil prices plummeting late last summer, and huge layoffs in Calgary alone from the energy sector and affiliated service companies, is it any wonder that we all voted NO yesterday to the same old same old? Interestingly, the Full Moon in Scorpio on Sunday night EXACTLY connected to the NDP chart’s Neptune in Scorpio in the 6th House of what we expect from the daily operations of this party (Neptune rules Pisces, and Scorpio brings forth passion once we release the fear of even thinking about connecting to that passion). The Full Moon phase is ILLUMINATION of how we were operating in the dark before now. Neptune asks us to IMAGINE a better world, life, BEing, via love and compassion for the good of all. It shows us how to dispel any illusions or delusions along the way. The Moon rules our emotions AND intuition, and the 4th House of home/hearth/nurturance. Can you all see how timely the election of the NDP into leadership has come about? What is also interesting to note is where Jupiter in Leo is activating this chart – in their 4th House of Home/Province place that we live in! Leo rules leadership as a TEAM, from the HEART. Jupiter expands and magnifies this energy and is currently activating the NDP chart’s Moon and NORTH NODE (direction the collective soul wishes to head into) in that 4th House! The Rising Sign of the NDP chart is Taurus (ruled by Venus) speaking of VALUES, money, what we do for work to bring income into our lives, using all our senses, resources, skills and talents in a HANDS ON, tactile way, to CREATE something of beauty. Therefore Venus at 29 degrees of Capricorn in the NDP chart speaks of the END of a cycle of HOW women (Venus) have been viewed and valued (Taurus) within traditional roles and institutions (aka government, law, health, education, medicine, insurance, military, corporations, to name a few). NOW is the time for Future (Aquarius) change for this province of ours. Most of Canada and Alberta were surprised to see such sweeping change. I was not. When I look at the NDP chart, seeing MOST of its planets sitting within the 4th QTR of the chart, the meaning of which is to ‘transcend Ego’ in order to BE of service for the good of all – well friends, the time is NOW, the FUTURE is here, and those 28 women are more than ready to roll up their sleeves to get to work! Alberta as a province has always been known for its history of entrepreneurs, pioneers and gutsy men and women who decided NOW is the time to change the status quo! Look how much we have grown and overcome and built in just 110 years! What will we see change these next four years, let alone 100? I look forward to seeing HOW Rachel Notley and her fellow women build a better province WITH integrity, equality and balance for ALL Albertans. Learning from the past, to ensure a better future.